We have a rare visitor in Broome at the moment, which is rather nice! The last time we had a Banded Lapwing Vanellus tricolor visit was 25th February 2008 and prior to that was 23rd September 2005. On those occasions the bird was on one of the school ovals, but this time it has decided that the Golf Course right against the Poo Ponds is the place to be. 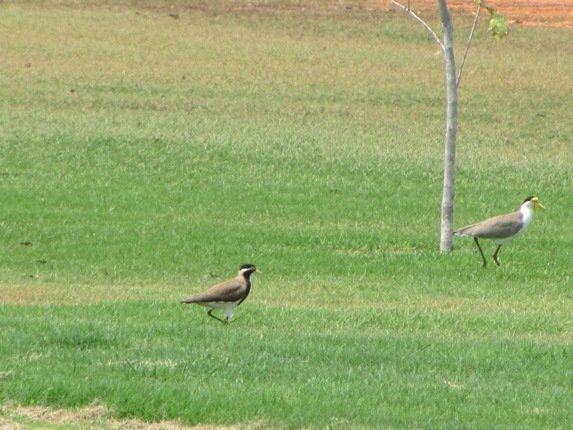 It is with the Masked Lapwings Vanellus miles and enjoying the lush green grass as a result of recycled water from the Poo Ponds. 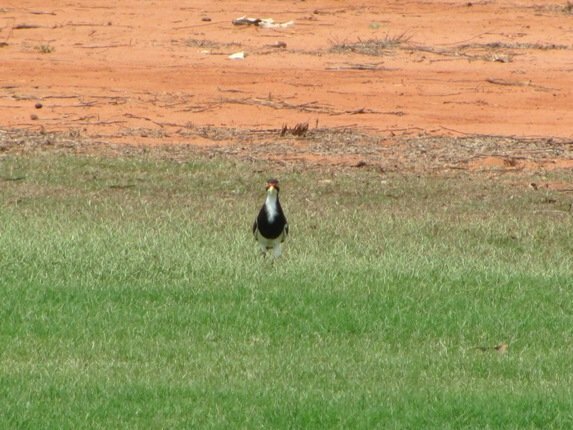 The sound that comes from a Banded Lapwing is not as raucous as the Masked Lapwing and it is quite a spectacular bird. It has been here for a week now despite the golfers and the birders, so it will be interesting to see how long it actually stays. Their range is predominately south of the Tropic of Capricorn and west of the Great Dividing Range, so it has come a long way north to be in Broome. 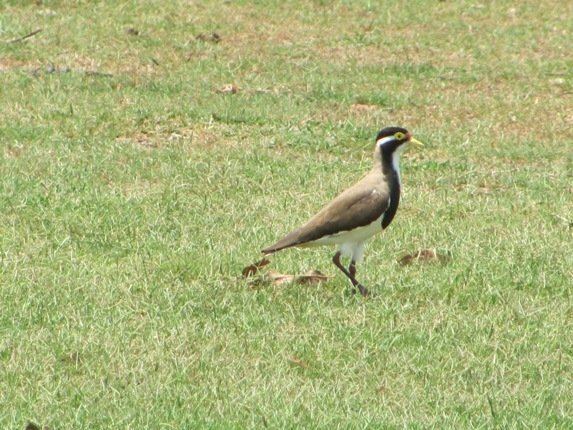 It is a smaller bird at only 25-29cm, whilst the Masked Lapwing is 30-37cm. 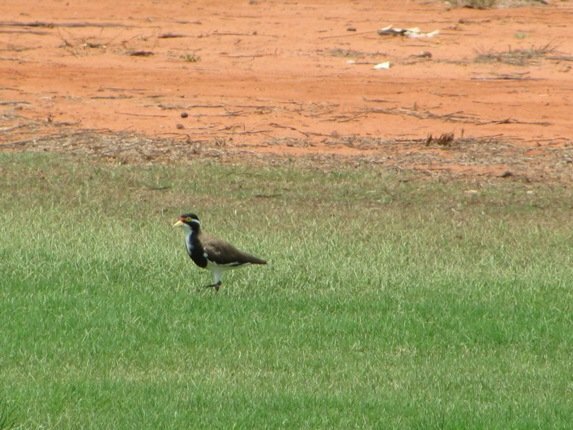 The Masked Lapwing does however have two subspecies nowadays and is the Vanellus novahollandiae in south-east Australia. Our northern subspecies is smaller, more slender, longer legs, less black on the head and no black on the neck or breast. The yellow wattles are larger as well, but there are hybrids between the two species with varying amounts of black plumage. 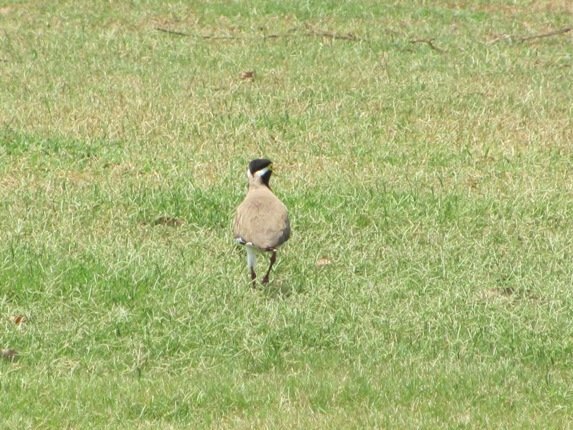 From our experience we would not recommend camping near either of the two subspecies of Masked Lapwing ….they are NOISY!! I wonder if your next visitor will be in 2014? Nice pics and cool bird! The straight on view reminds me of John McEnroe. I think i have seen these birds at Exmouth, they too are at Exmouth golf course. 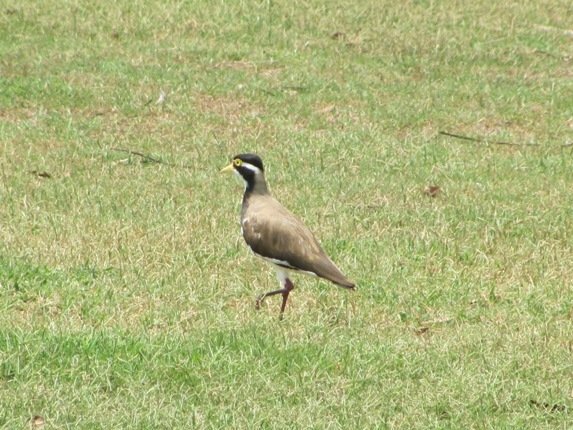 @ Dianne-yes, I think you will get the Banded Lapwings, but probably not Masked Lapwings with you. Golf courses are good for birding-especially if near Poo Ponds!